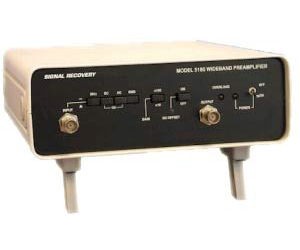 The model 5185 is a wideband voltage preamplifier with a frequency response from DC to 200 MHz and switchable gain settings of x10 (20 dB) or x100 (40 dB). It has a selectable input impedance of 50 Ohm or 1 MOhmand a DC offset facility. The 50 Ohm frequency response extends from DC to 200 MHz with an equivalent input noise of 10 nV/root Hz at 10 kHz. The 1 MOhm response exceeds 100 MHz, has switch selected AC or DC coupling and an equivalent input noise of 30 nV/root Hz at 10 kHz. A ground switch allows the input signal to be isolated from the output and an adjustable offset facility allows a DC offset on the input signal to be subtracted before it reaches the amplifier output. An overload detector is also provided. The unit is powered from a remote line power supply module, model PS0108, included with each instrument. Signal connections are made via the front-panel BNC connectors. The model 5185 will prove invaluable for users who need a compact, low cost, high performance wideband preamplifier. It is an ideal accessory for use with oscilloscopes, digitizers, signal averagers and boxcar averager systems.